Drywall is a low-cost, attractive way to make your home comfortable. Made from gypsum and crystalline water, this type of wall and ceiling has become the most popularly used material for homes in the US. But if not repaired properly when it is needed, damaged drywall can cause not only structural problems, but health risks as well. House Settling – as your home settles, the framework may shift and even a slight shift can cause strain to make your drywall crack. 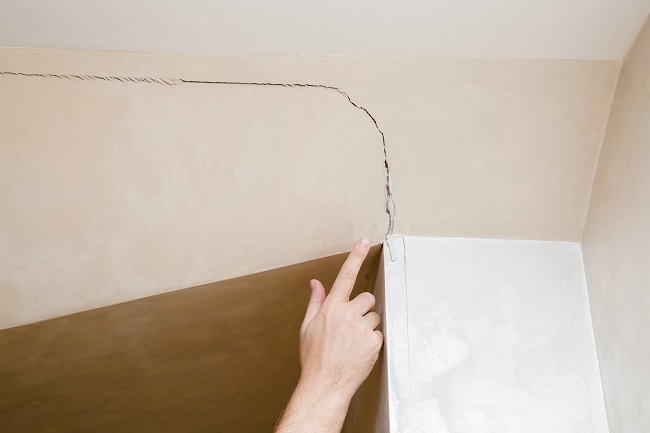 Poor Installation – Sometimes drywall is not installed properly and this can lead to cracking and exposed seams. Moisture – Any time drywall is penetrated – either with drywall screws or nails to hang things on – it will weaken and expose the insides of the drywall, making it vulnerable to dampness and moisture. Additionally, if your drywall has been exposed to moisture, you risk mold building up in ways you may not even be able to see. The medical effects of mold range from slight – headache, cough, congestion – to deadly – neurotoxicity, cancer, pulmonary fibrosis. In much the same way a windshield crack slowly spreads across the entire window, a simple crack or unstable seam can lead to increased cracks and crumbling walls. Not making necessary repairs to your drywall can lead to more expenses in the future because the longer you wait, the worse the damage will become. This can cause a small job to become a much larger and more expensive undertaking. Contact us today to arrange for a consultation so we can work together to ensure you and your family are safe from drywall damage.